Ok, I’m in Yangshuo. 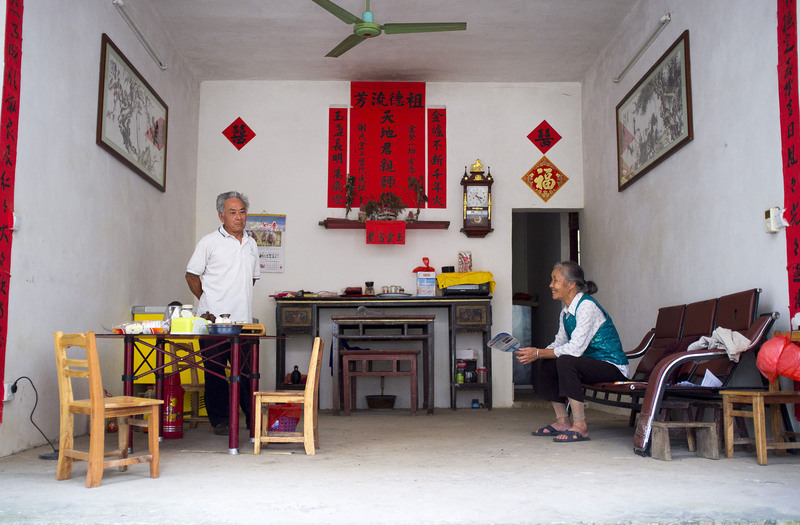 It’s a town popular among tourists thanks to its karst peaks, rivers, caves and temples, but is noticeably different from most typical Chinese cities, such as Anshun, Tunxi or Kunming. 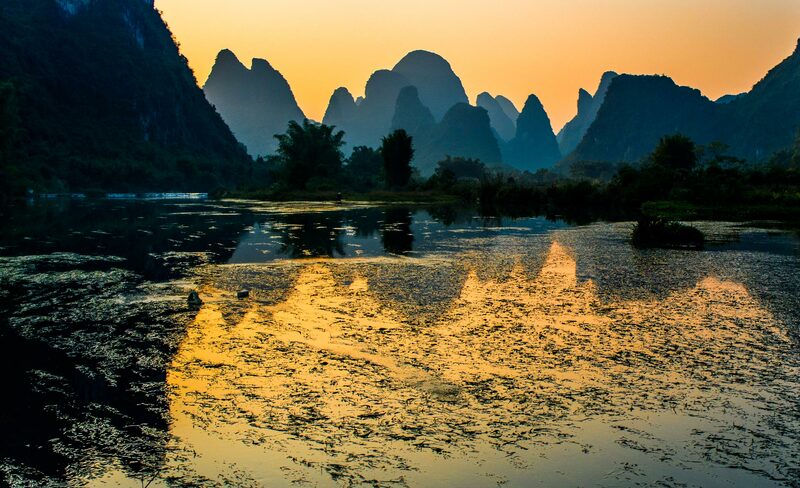 Yangshuo is a famous stop among independent travellers in Southern China, to try their hand at rock climbing, to explore the local countryside by bike, or to take a bamboo raft down the river. 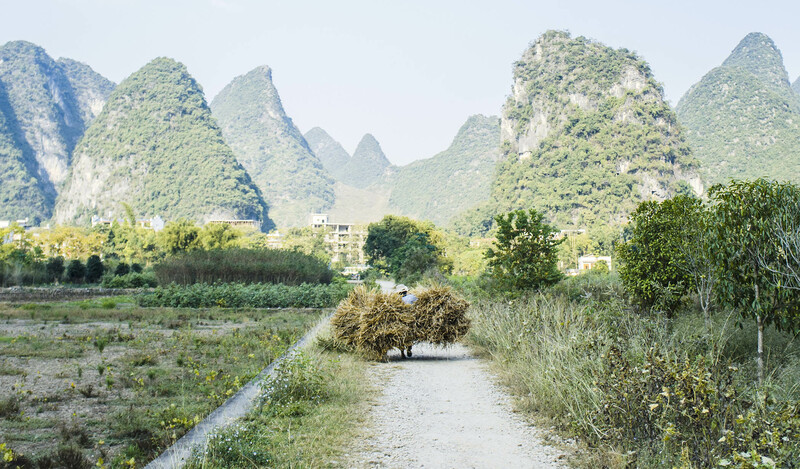 Today Yangshuo is a beautiful big town that has loads to offer, from dormitories to cafes, and over the years has become a destination on the banana pancake trail. This place leaves me with mixed feelings, but should be seen first hand before being judged. A reason to wake up in the mornings. Beautiful scenery here is a common subject of inspiration for Chinese painting and poetry. Watch the sunrise video. But this city’s authenticity has been diluted, in large part, by tourism. 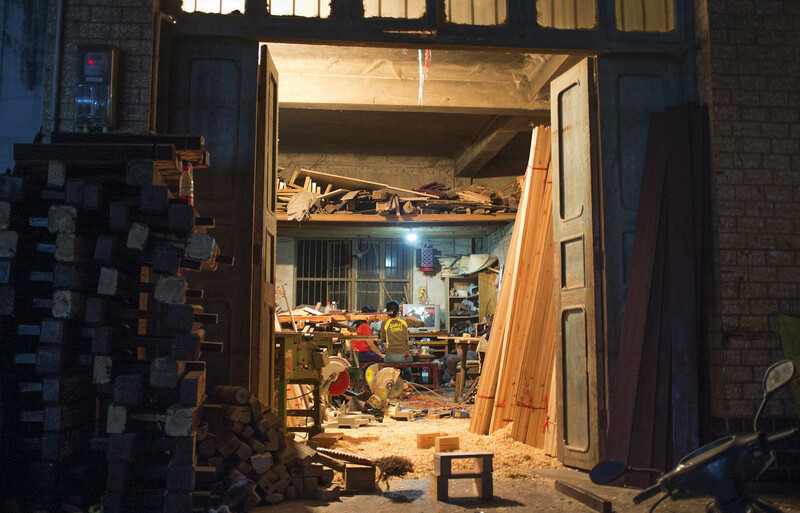 More recently, the city was quiet and served as a base for exploring the province of Guangxi. It’s landscapes are filled with wavy hills, curvy blue rivers and farmers leading buffalos through the wet fields. Today these rivers and mountains are swamped with loud tourists, touts offering cheap rooms, nightclubs with half-naked pole dancers and stalls selling Frankfurter sausages and German beer. More people are moving here from Beijing and Shanghai to get away from the stresses of the city. View on the River Li. The city is surrounded by wavy hills, some of which are accessible for hiking. A person lives on the hill here, he asks hikers for a small fee to go to the viewing point, in return he gives them a bottle of water, which is very nice of him. That is the view from his home. Temple on to of the hill in the city. 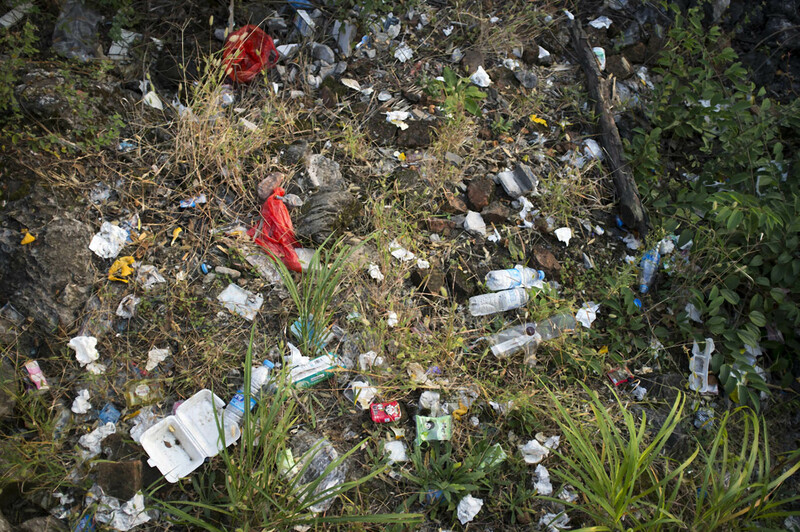 The areas further away from the main well trodden path are poorly maintained, and rubbish eventually builds up. 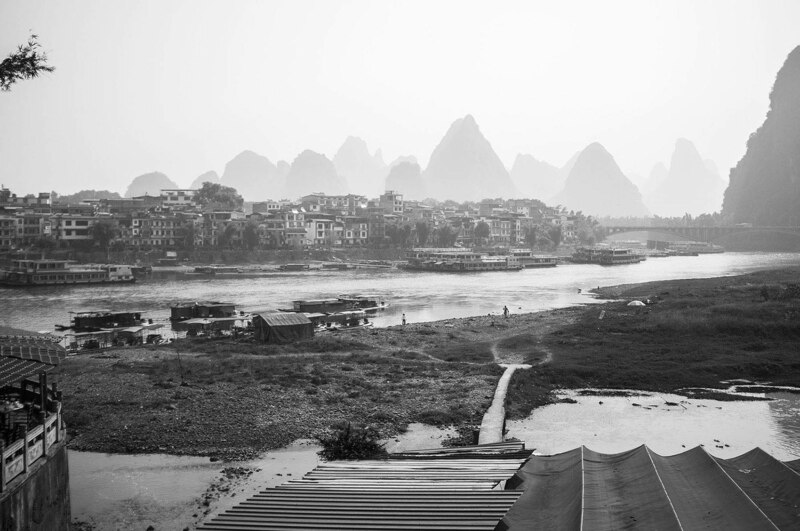 As a well marketed place, Yangshuo is rapidly building new infrastructure to attract more tourists every year. The city is updating rapidly; the area is being fitted with new roads and fields and replanted with trees and vegetation. All the work is done by cheap immigrant labor. 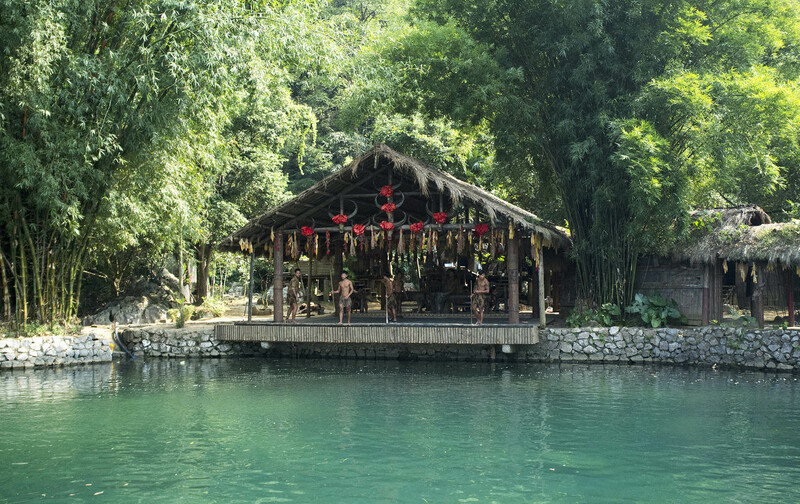 For those who decided to explore the beauty of the area by the boat, an ‘aboriginal tribe’ dance spectacle is available every time a boat drifts past the shack. As the boat passes by, a bunch of hunks are taking a smoke break. As local entertainment, for additional money, tourists are invited to roll in the mud and get their photo taken against the backdrop of fields, recently planted with flowers. They can go boating with hundreds of other tourists and for about 100 quid they can see the Yangshuo fire fishing festival at night. The city has quickly turned into a tourist hunting ground, where for money, thousands of tourists become easy prey for travel agents, touts and sellers each year. 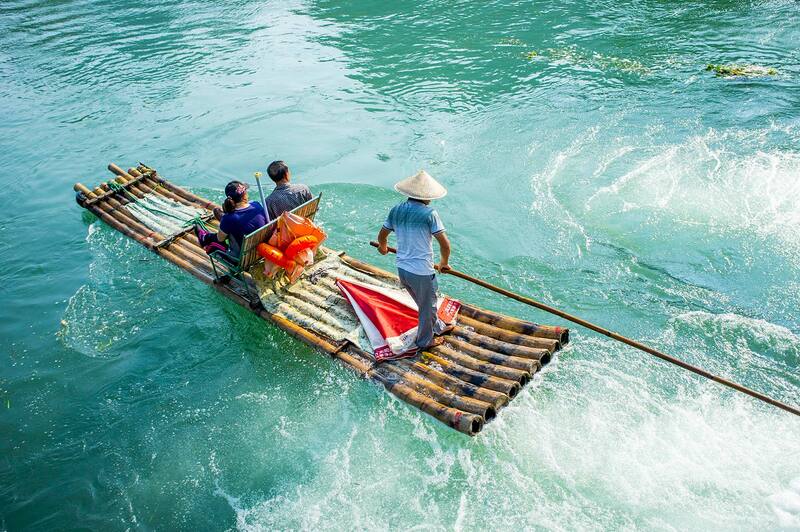 Well known bamboo boat ride. But go only a kilometre in to the woods and you enter the wilderness, where the hardworking farmers lead their buffalo through the fields. Woman carrying dry stock for bulls. 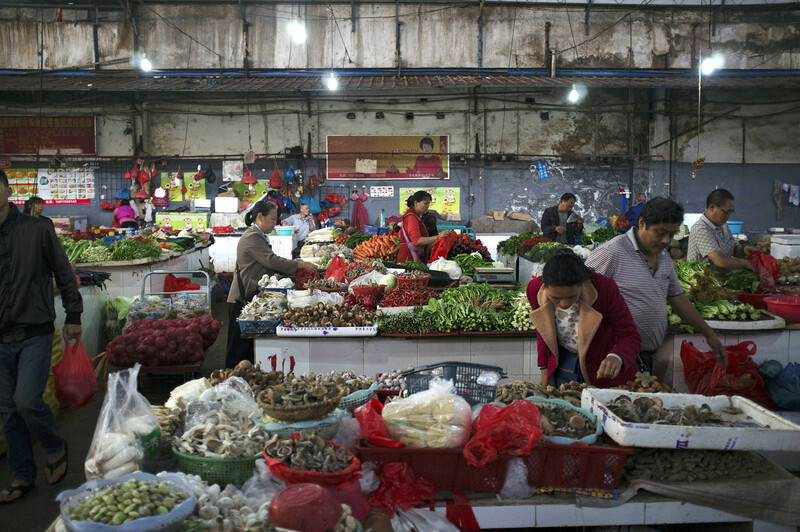 As have mentioned before, the Chinese love pork, but because of the hot temperatures in the summer, meat on the markets is sold in small portions and in a few places as it quickly goes off. Vegetables and spices are essential accompaniment to all foods. 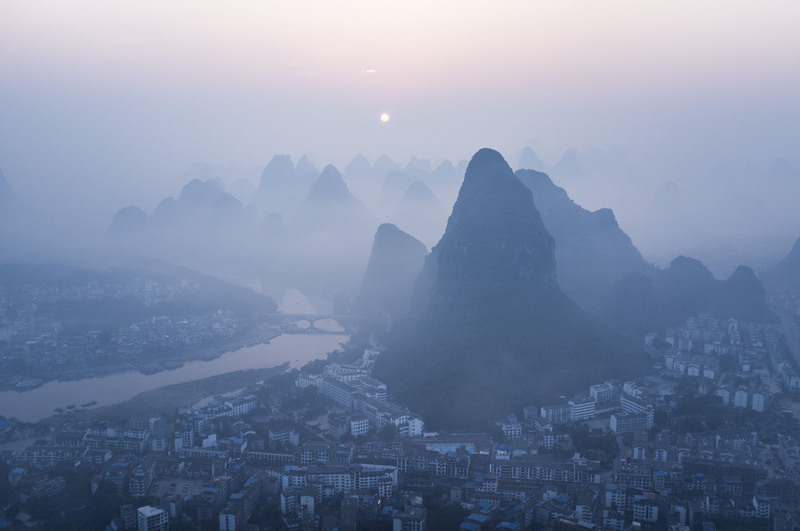 Covered with plants, the karst rock hills, shaped like camel humps, have been formed by the winds blown in from the river banks. In the evening the landscape is fascinating, it gives the city a very interesting sound wave like shape. 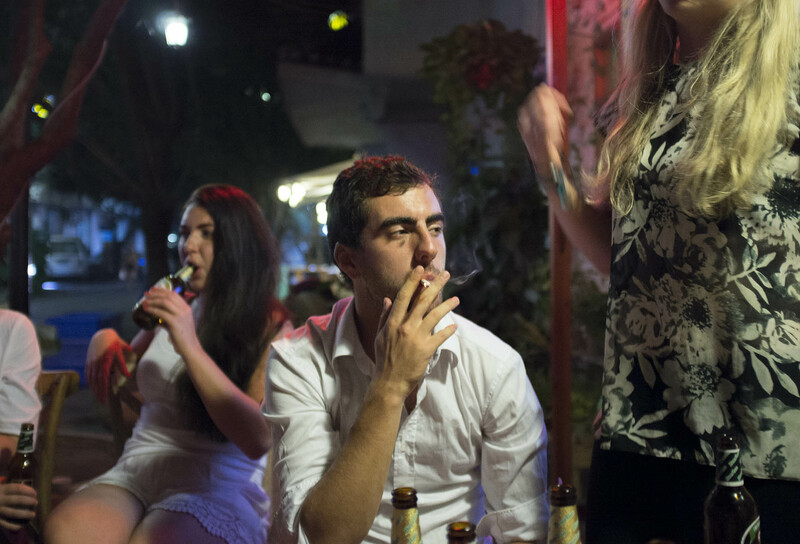 Along with the growth of Chinese drinkers, western tourists find Yangshuo the perfect place to enjoy alcohol. 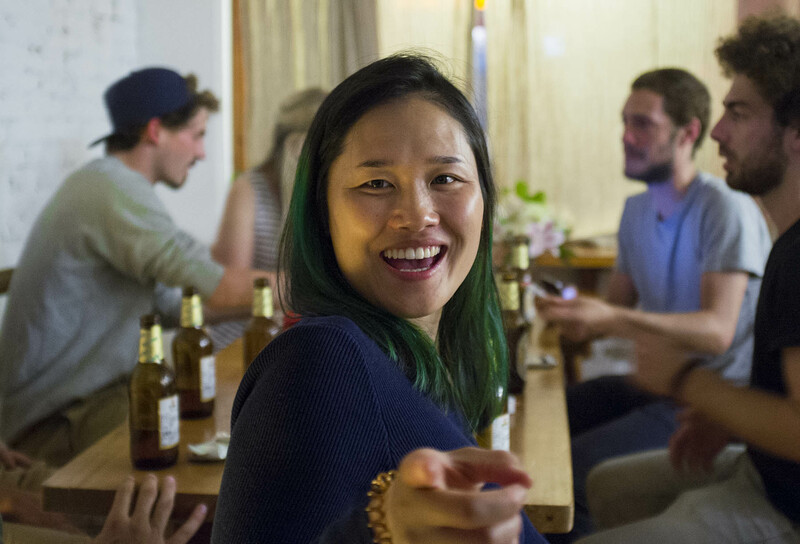 This pub is owned and run by a german traveller and his Chinese partner, it aims to warm up tourists with relatively dear local beer, overpriced imported beer and complimentary free whiskey. People are usually very trustworthy and in a place like this, and in many other Chinese hostels and restaurants, everything runs on trust. This pub has a chalkboard where visitors puts the number of beers they’ve drunk, which then pay for when they leave. Traditionally the Chinese like to get their toxins out and so something like farting in public places is pretty common too. China is rapidly changing though and in opening up to the world, western etiquette is being learned and encouraged across touristic places and big cities. No farting sign in the local pub. Hating China has become very popular recently. Some accusations are partly true, but very shallow, like that some parts of China are quite polluted and poor, political freedom is far from that in the West and the web is highly censored. However, the first observation is always easily available and brief. It does not require much effort to notice that Chinese children are dressed in split pants, it’s much harder to understand why this is done. During a passionate conversation the true face, emotion and disappointment is revealed in the face of a visitor. For the foreigner town is an easy paradise. Even with the things we don’t understand and the culture shock, China is still full of surprises and calm and helpful people. When we got lost, we were invited into this house, where we drank water and ate purple sweet potatoes. The owners showed us their “modest” three-storey house, and after their hospitality, showed us the way and waved us goodbye. People who restore your faith in humanity. Owners of the house we were invited in for some tea.